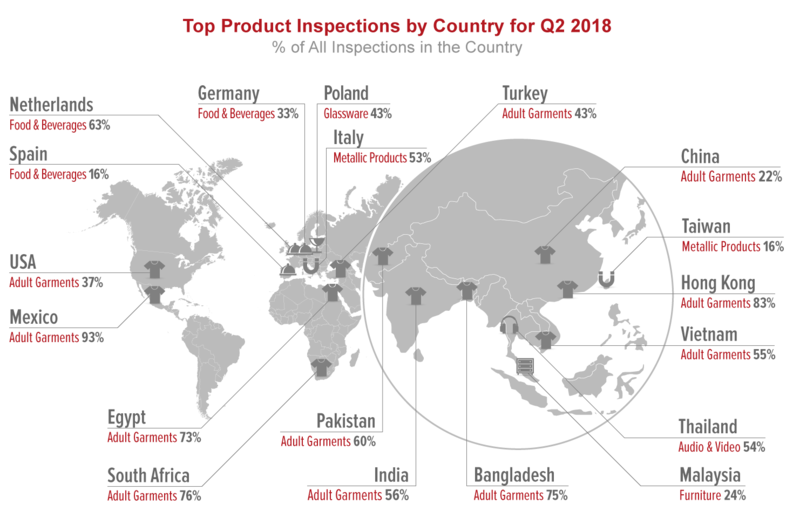 While concerns about international trade tensions abound halfway into 2018, QIMA's latest data on quality inspection and supplier audit demand offers some perspective on the shape of things to come in global sourcing. Despite the fears of further trade escalation between the US and China, the manufacturing giant remains ahead of its latest growth forecast of 6.6%i with QIMA's half-year figures showing inspection volumes in China rising +8.3% YoY in H1 2018. In Southeast Asia, growth remains robust, in line with the economic forecasts for the regionii, with Cambodia, Thailand and Taiwan in the lead, showing double digit YoY growth in inspection and audit volumes in Q2 2018. Meanwhile, in South Asia, Bangladesh is recovering from an earlier slump, with inspection volumes expanding +4.5% in Q2 2018. 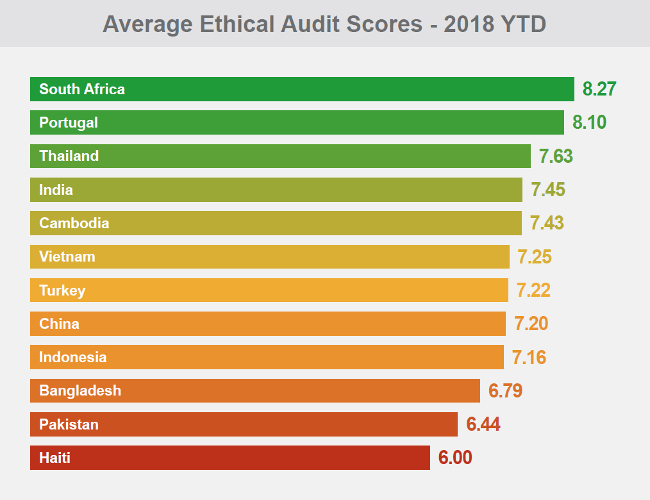 Even though overall ethical scores recorded by QIMA auditors in Q2 2018 remain higher than the average 2017 values, it is obvious that manufacturers have failed to maintain the previous quarter's improvement pace. Over a third of factories received "Amber" rankings, indicating that improvements are required in the medium term to prevent further deterioration. Notably, QIMA's latest data highlights a strong correlation between a factory's size and its sustainability profile, echoing the discussion around this topic at the QIMA Sustainability Conference held in April 2018 in Hong Kong. 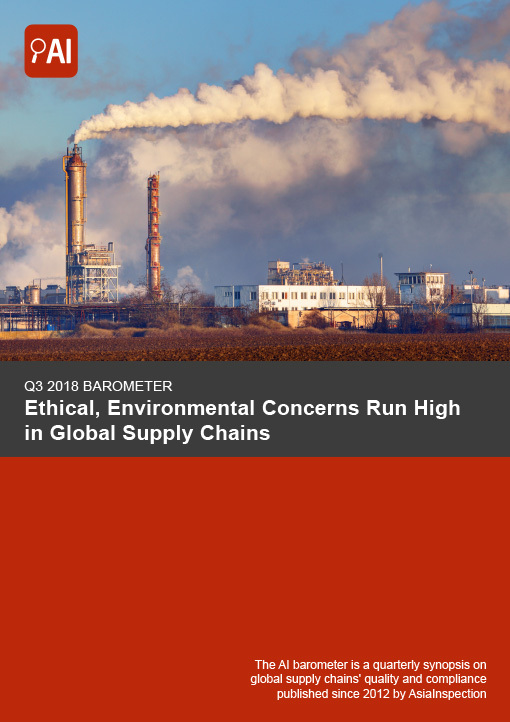 For instance, so far in 2018, small factories in Asia consistently fell behind during onsite audits compared to larger factories, scoring some 6.5% lower on social compliance criteria, and 14% lower on environmental issues. In China in particular, smaller factories (employing 100 workers or less), while comprising less than half of all facilities audited for environmental compliance, accounted for more than two-thirds of major non-compliances in H1 2018, with waste management and pollution prevention being the most common issues by far. That said, Chinese factories of all sizes lag behind the rest of Asia in terms of environmental compliance. During H1 2018, Chinese manufacturers received some of the lowest scores on waste management and pollution prevention among the countries serviced by AI, scoring on average 21% lower than their counterparts in the rest of Asia. This data indicates that businesses rushing to clean up their supply chains in China before the new round of government inspections should be prepared for an uphill battle. Meanwhile, ensuring safe working conditions remains another challenge for global supply chains, as seen from QIMA's latest structural audit data. While in Q2 2018, fewer factories were found to have immediate critical risks threatening worker life and safety, the share of fully compliant ("Green") factories has hit a two-year low at less than 20%. This indicates that an overwhelming majority of factories require improvement in the medium term, and failure to remediate will exacerbate their structural risks over the following quarters, especially in parts of Asia affected by the monsoon season. A comparison of QIMA data from in-factory product inspections and lab testing during Q2 2018 shows that while manufacturing quality slightly improved across the board, not all products did equally well in terms of chemical safety. 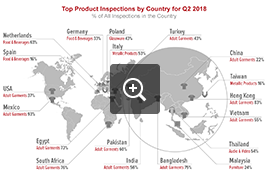 Onsite inspections during Q2 2018 found approximately 19.5% of products to be outside acceptable quality limits, continuing the long-term trend for improvement. As always, there is regional disparity to the findings. For instance, China's product quality has recovered after the seasonal deterioration around the Chinese New Year, with Q2 failure rates hovering around the 19% mark. 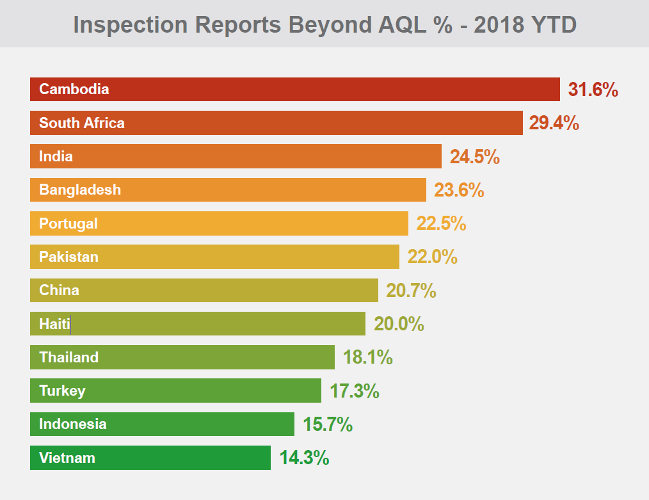 Meanwhile, South Asian manufacturers are stepping up their product quality, with both India and Bangladesh notably reducing the share of products outside AQL over the past 12 months. These improvements may be credited to the ongoing modernization efforts made by South Asian manufacturers in a bid to remain competitive. The manual-heavy Textile sector remains the worst performer among the industries serviced by AI, with roughly a quarter of products failing onsite inspection. By contrast, Toy manufacturers appear to have made great strides in product quality over the past 12 months, pushing the inspection failure rates below 20%. Meanwhile, the technologically advanced E&E sector remains among the best performers, with 16% of products being found outside of specifications. The brands' and manufacturers' increased focus on product quality is echoed in the improved rates of chemical compliance in lab recorded in Q2 2018. Failure rates due to excess amounts of lead and heavy metals continue to decline among the products aimed at the US market. Additionally, suppliers of toys and juvenile products to the US are doing a better job at complying with phthalates bans: so far in 2018, average failure rates in this category stand at 7%, compared to 10% in 2017. Notably, for other product categories, compliance with phthalate bans remains a challenge, with little improvement compared to last year. Continuing the trend observed by QIMA in the previous quarter, there remains a difference between levels of chemical compliance of products intended for the US and the EU, as suppliers to the latter struggle to comply with regulatory thresholds for heavy metals. In Q2 2018, failure rates due to unacceptable amounts of lead, cadmium and other heavy metals reached 8% in products intended for the EU market. Additionally, failure rates due to nickel release exceeded 15% in the Eyewear category. QIMA is a global leading quality control and compliance service provider that partners with brands, retailers and importers around the world to secure, manage, and optimize their supply chain. QIMA performs Supplier Audits Programs, Product Inspections, and Laboratory Testing. Clients from over 120 countries worldwide benefit from webbased mobile friendly account management, fast scheduling, and highly competitive all-inclusive pricing: $309 for Product Inspections and $649 for Factory Audits. QIMA guarantees on-site arrival within 48 hours of booking, and a same-day inspection report available online. With over 2,000 inspectors and auditors classified by product range and auditing expertise, account managers speaking over 20 languages, and service coverage of 85 countries, QIMA is Your Eyes in the Supply Chain™.